Everyone wants younger looking, healthy, radiant looking skin as they age. Unfortunately, environmental elements and sun exposure both take their toll on your skin leading to fine lines, wrinkles and a dull complexion. As you age skin loses its elasticity, the production of collagen and elastin decreases, two compounds that are needed to keep your skin moist, supple and youthful looking. Skin care scientists have made great progress in developing products that can help reduce the signs of aging and slow down the aging process. Ingredients such as L-ascorbic acid, hydroxyl acid and antioxidants improve the signs of aging with regular use and can help prevent new lines and wrinkles from forming before their time. Antioxidants help protect skin from free radicals while improving skin’s appearance. They also work to repair damage and help moisturize the skin. You can get antioxidants from a healthy diet that includes eating foods rich in vitamins C, E, and A. It also helps to use skin care formulas that contain antioxidants. Using Skinceuticals C+AHA samples can help you combat the signs of aging much better than diet alone. The active ingredients in this formula are hydroxyl acid, which will exfoliate the skin in a gentle manner by removing dead skin cells so your face looks more radiant and glowing. L-ascorbic acid protects against the harmful effects of the sun's rays. Taking daily care of your skin and using preventative measures to prevent further damage to the skin will go a long way in your skin care regimen. Using sunscreen and wearing a wide-brimmed hat will also help protect your face from further sun damage. Spending years baking in the sun and living around a lot of pollution, takes its toll on your skin. Facial skin can be very delicate and more susceptible to harsh environmental elements. Skinceuticals C+AHA samples can not only rejuvenate and refresh tired looking skin, they are excellent for on-going skin care to slow down future damage. If you're sick of having dull and tired looking skin but don't want to spend the money to visit a dermatologist, there are solutions available on the market today that give wonderful results and are very cost effective compared to those of a specialist. Younger looking skin is a major concern for many people these days. With so many pollutants in the air, ravaging your skin daily, it's time for you to fight back and get rid of those tiny lines, wrinkles and blemishes. You don't have to let the environment destroy your skin. 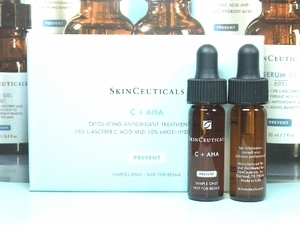 Skinceuticals C+AHA samples help improve the look of the skin. The combination of ingredients not only helps improve your appearance on the outside, but goes to work deep inside the skin as well. Six samples will give you 1 oz. of the product to see how well it can work on your skin. These samples are a great value and also a practical way to purchase the product. The sample size is perfect for popping into an over-night case or your purse. They’re also a great little gift for a girlfriend who wants to know why you’re looking so great these days. You deserve youthful, radiant looking skin. Get rid of the tired, dull look and put your best face forward. You'll love the results from having a better complexion and skin that glows.